AMES, Iowa — Chicago-based composer, sound designer, radio and visual artist Eric Leonardson will present an “eco-sensing” workshop and lecture Monday, March 26, at Iowa State University. Leonardson will speak about “Advances in Eco-Sensing and Soundscape” at 5 p.m. in room 130 College of Design. Part of the 2017-2018 Master of Urban Design /Master of Design in Sustainable Environments Lecture Series, his talk will encompass several ongoing projects that intersected via “Eco-Sensing and Soundscape,” a studio course Leonardson taught in fall 2015 at the School of the Art Institute of Chicago (SAIC). By connecting acoustic ecology concepts and practices with the hacking aesthetic of art and technology, the course sought to “open up possibilities for transdisciplinary collaborations and offer new understandings of our environments, our boundaries and locations and our roles within them as artists, designers and listeners,” Leonardson said. Leonardson also will lead a workshop on “Listening Above and Below; Eco-Sensing DIY” from 2 to 4 p.m. at the ISU Design on Main Gallery, 203 Main St., Ames. The workshop will introduce participants to “ear cleaning,” “soundwalking” and hands-on hydrophone making as well as sound maps and embodied sensing. Students interested in this workshop should RSVP to Alex Braidwood, assistant professor of graphic design and sustainable environments, abr@iastate.edu. 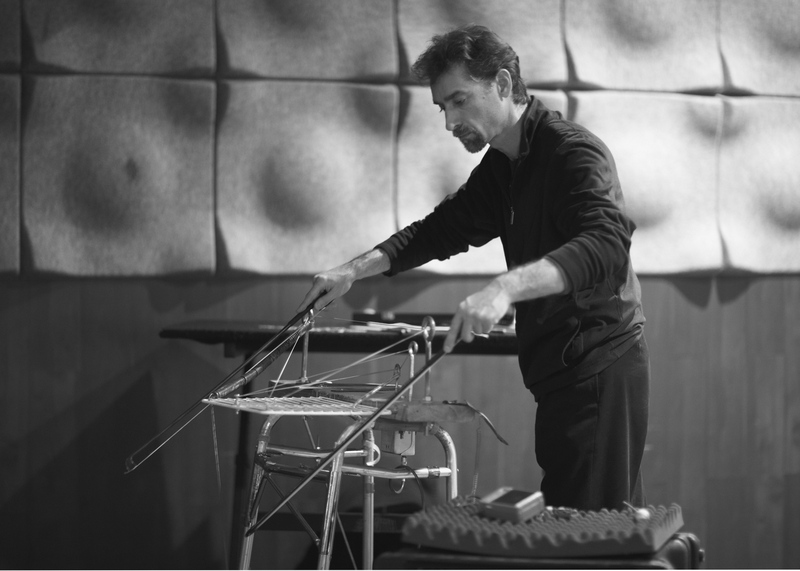 Leonardson performs regularly on the Springboard, an electroacoustic percussion instrument made from readily available materials. Applying his percussion skills and a piezo pickup to coil springs, wood, plastic combs and rubber bands, he creates rich tones and timbres that, in the words of composer, electronic musician and SAIC professor of sound Nicolas Collins, “evoke the sound world of a Balinese Gamelan orchestra.” Others compare these sounds to industrial vibrations and animal voices. Leonardson’s Iowa State visit is co-sponsored by the OPN Interdisciplinary Studio Fund, Bryce and Rita Pearsall Fund, Department of Graphic Design, College of Design and ISU Office of Sustainability.